First let’s go into a little bit of detail on exactly what we are referring to. During the manufacturing of an end mill there are various operations that create the necessary geometries which produce the final product. 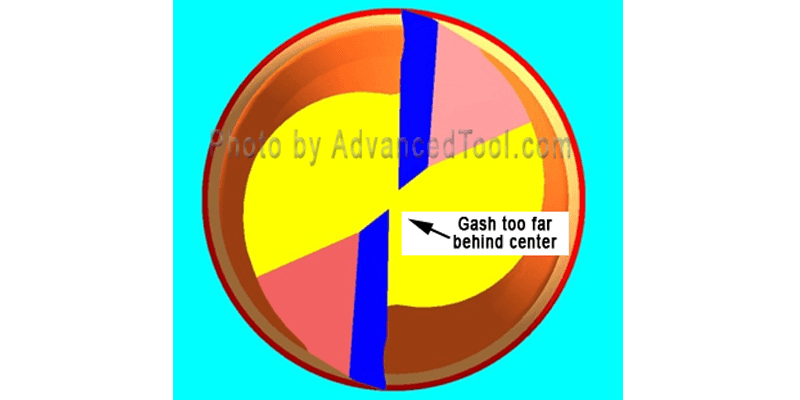 In this example we are teaching about Gash and Web Thickness. Without careful attention during the manufacturing process this is an area of the end mill that can easily be out of spec resulting in poor tool performance. 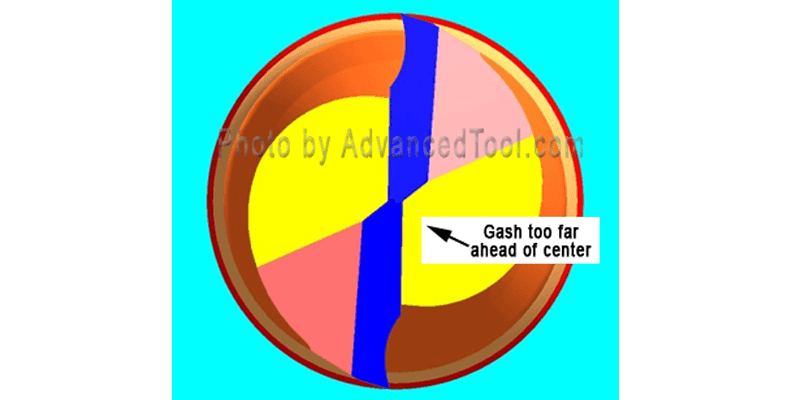 The Gash is the “operation of removing material” to create the Web Thickness along the very top of the tool. The Web thickness is the end result. Shown below on a 2FL End Mill (top view) it is the area in Yellow (gash) where it meets the thinnest point of the area in blue (web thickness result). The photo to the left shows an End Mill with Proper Gash and Web thickness. You’ll notice that the primary clearance intersects to a minimal point. 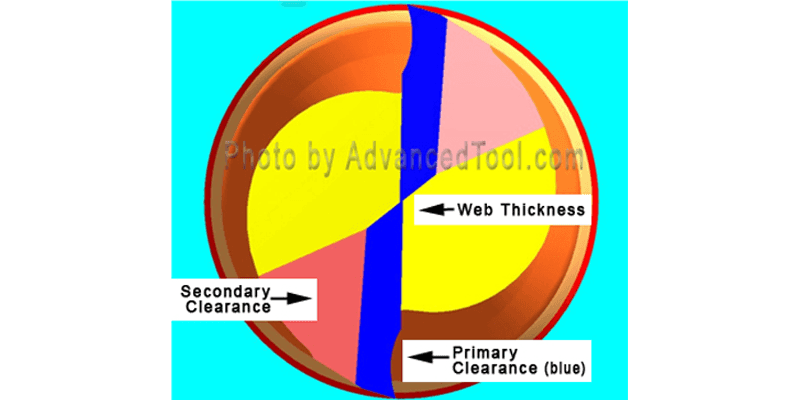 The exact ideal measurement of the web thickness will depend on the diameter of the end mill itself. This example below demonstrates and End Mill with the gash being too far behind center causing the web thickness to be non-existent. Results: This can cause the tool to be weak and break during operation. This example below demonstrates an End Mill with the gash being too far ahead of center causing the web thickness to be too large. Results: This creates an area along the end of the end mill that will not cut. This causes the end mill to work harder, requiring more CNC machining power. In an end cutting milling operation the tool will act dull even if it’s not. Specializing in carbide end mills, micro end mills and form end mills for the precision machining of Titanium, Stainless, Aluminum, Steels, & Plastics. We offer custom end mills and tailor made solutions. We knew we could do better for our clients by weaving intellect and precision into each end mill; resulting in a customized, consistent, superior one. Our goal is to manufacture high-performing and highly customized end mills for our clients, resulting in better performance, longer tool life, and smoother finishes. In addition to adhering to stringent standards and processes, Advanced Tool Inc also welcomes direct communication from our customers to continually fine-tune the milling process to increase production and reduce long-term cost. When you purchase end mills from Advanced Tool Inc, you know what to expect. We pride ourselves in following strict internal processes in engineering/design, formulation, testing, and consistency—so you will receive the same superior customized end mill in every batch—allowing you to produce your own product with utmost confidence in ours.